WHAT…..A…..WEEK! A new trailer for “Star Wars: The Force Awakens”, “Back to the Future” celebrated a HUGE anniversary and now this. We challenge you to name another band that was more influential in music and the very fabric of culture than The Beatles. They influenced fashion, movies, music and were the voice of a generation. 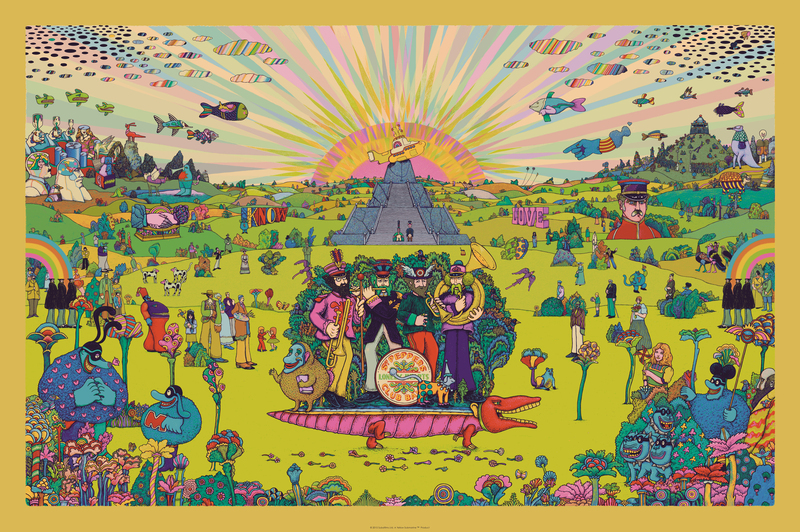 Today Dark Hall Mansion is announcing a new, officially licensed print for one of the Beatles most memorable offerings, “Yellow Submarine.” This time out they have partnered with artist Marq Spusta who has come up with a print that perfectly captures the the psychedelic vibe of the film and it’s unforgettable music. Here is what they had to say about this fantastic new offering in their official press release. Dark Hall Mansion is honored to reveal a piece over a year in the making, our officially licensed Beatles limited edition print, “Pepperland,” by contemporary artist, Marq Spusta, on sale next Tuesday, October 27th, 2015! All editions go on sale next Tuesday, Oct 27th, 2015 at 9:30 AM PST on Dark Hall Mansion’s OFFICIAL STORE PAGE. 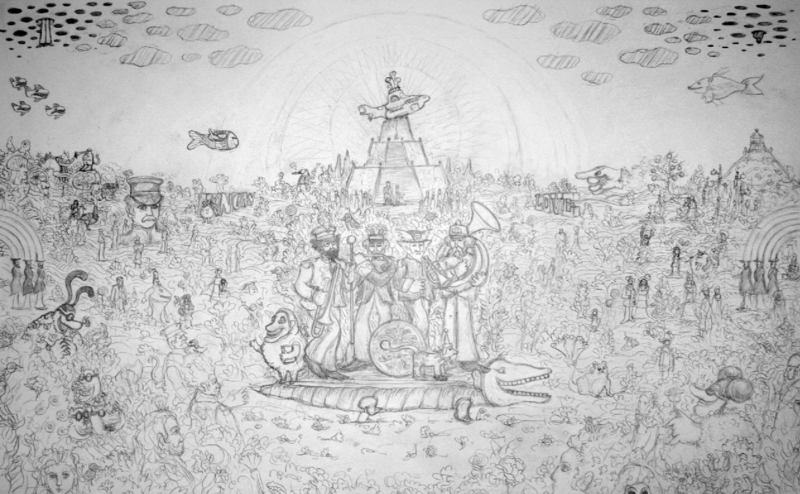 We spoke to artist Marq Spusta about this project and here is what he had to say. BLURPPY – Tell us a bit about yourself. How long have you been doing art? 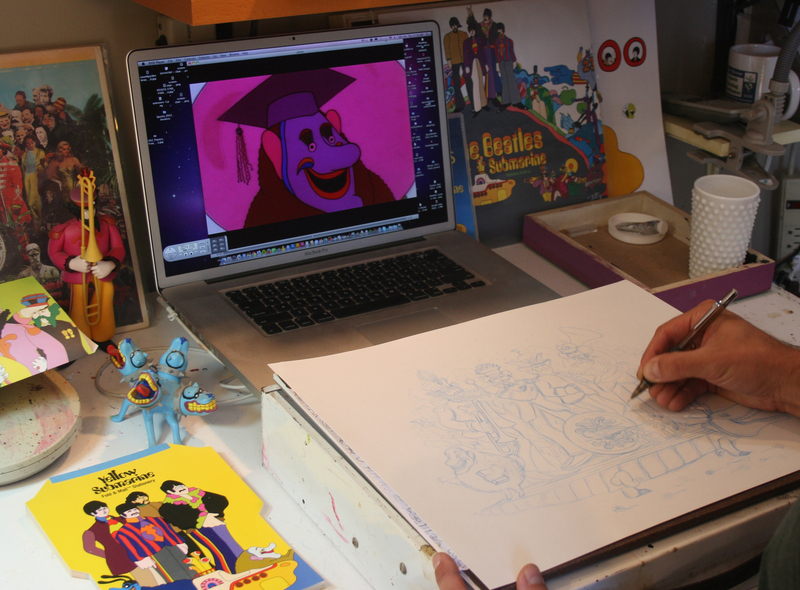 Marq – Well, I’ve always been drawing since I was a little squirt. In the past ten or so years I’ve been able to create about 100 concert posters for many of my favorite musicians, like the Grateful Dead, The Black Crowes and Dinosaur jr. 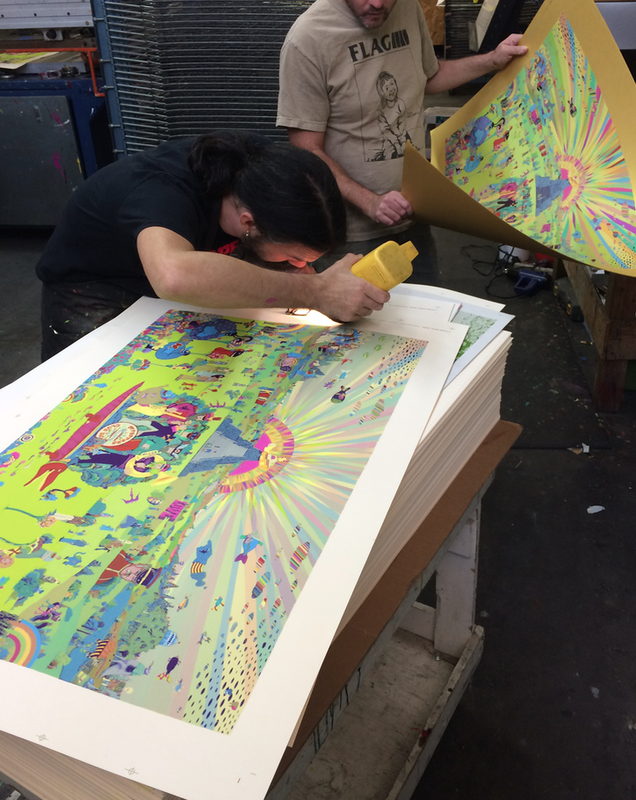 Along with the posters, I’ve worked on many album covers, beer packaging, a children’s book, stage designs and have put out piles of screen prints. I live in a small, beautiful coastal town just south of San Francisco with my wife, son and dog. I’m a happy man. BLURPPY – The Beatles are such a massive, iconic group, what was it like to work on this project? Marq – Endlessly inspiring. I believe in The Beatles. They have always been a positive influence in my life and culture in general. I worked on this project for over a year, but there was always something more about the band, the music, the folklore or my personal memories that would offer continuous inspiration for such an undertaking. I am very thankful to have gotten this opportunity. BLURPPY – We love the intense detail in all your work. Can you tell us about your process? Marq – My typical process is to pencil sketch things out, play with the rough composition and vibe of the piece. If that’s well received by everyone involved (which it was for this print), then I will draw it out in pencil at comfortable size, and then ink the backline layer directly on top of the pencil drawing. Once I get a clean inking, I bring that into photoshop and start coloring in the different transparent ink layers with my over-sized antique Wacom tablet. Since this piece was so expansive, I ended up scanning in the sketch and using it as a guide to draw many of the elements and landscape directly in the file. BLURPPY – How long did this print take and do you have any favorite section? Marq – Ooh, I’ve been working on the final art for over a year… I obviously did some other things this year, but it seemed like this print would just gobble up weeks of time from me just on certain areas. Very slow going. I don’t want to know how many hours really, Dark Hall Mansion always joked and asked when my Sistine Chapel would be done. A favorite Section? that’s an interesting thought for me, I guess I am really glad we added a lot more characters from the sea of monsters close to the horizon…that was one of the few art directions I received, to add more monsters, and I’m glad I did – they are all fun and very surreal characters. BLURPPY – Are there any hidden easter eggs in here that we should be on the lookout for? Huge thanks to Marq for taking the time to talk to us about this fantastic project. You can follow him via the following links. 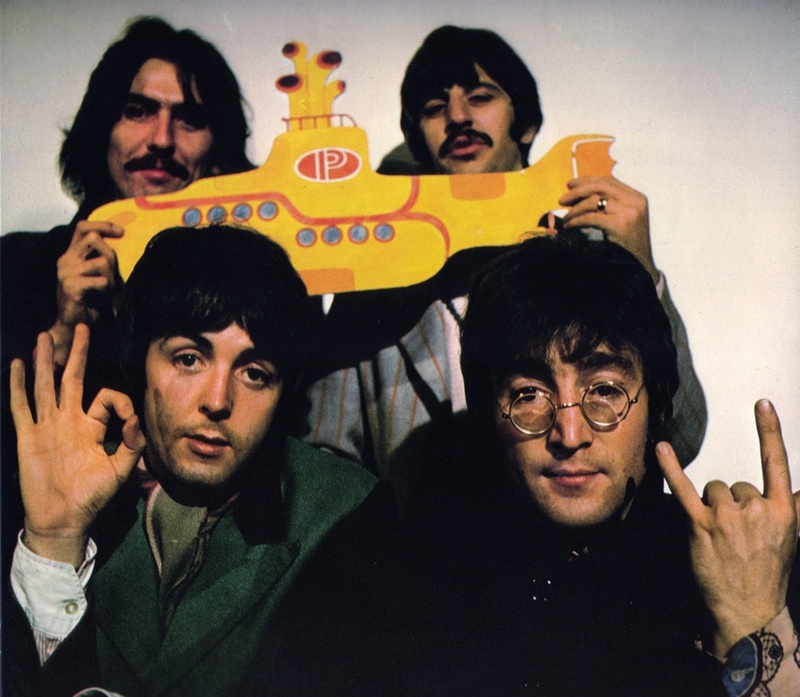 This entry was posted in Art, Dark Hall Mansion, Movies, Music, Pop Culture, Posters and tagged Dark Hall Mansion, film, Marq Spusta, Movie, Music, Pepperland, poster, The Beatles, Yellow Submarine. Bookmark the permalink.